Ancient luxury Majorcan house, newly rebuilt, that keeps all the essence of ancient times. 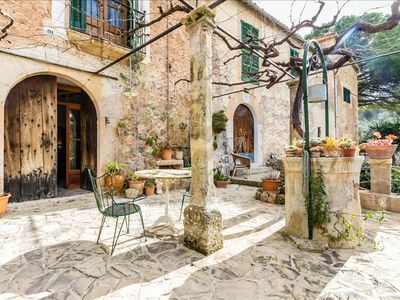 It is set on the outskirts of the beautiful Valldemosa, in a very quiet area just a few minute walk to town. The house features a big and beautiful garden. On the ground floor there is large hall that takes us to the dinning room, from where you can reach an small patio. A homely living room takes us to the kitchen, with a door to the patio too. There is also a toilet. The first floor consists of a large living room, three bedrooms and a bathroom.